Ukraine Becoming A Terrorist State? BATTLE FOR WORLD – March 29, 2018: With the West (European Union and the United States) supporting the coup that overthrow President Viktor Yanukovych from power, now the country of Ukraine is showing its true intentions of the West. I hope people realize that civil warfare, military warfare inside country and terrorism have nothing to do with “true freedom and democracy”. Maybe all this is leading to the total destruction of Europe eventually? Very sad. BATTLE FOR WORLD / RT – December 26, 2018: The article highlights that the Islamic State-trained militants are fighting alongside a state army in a European country, the Times reports – but that detail is buried in an article talking about how Putin is a common enemy of Ukrainians and Chechens. BATTLE FOR WORLD / RT – December 22, 2018: The article highlights that Trump’s abrupt call for US troops to leave Syria is being lambasted by his domestic critics as “a gift to Russia.” The paradox is that peace signals on Syria could bode sharper conflict with Russia in Ukraine. Hardly a gift. Earlier this week (third week in December), Kurt Volker, the Trump administration’s envoy to Ukraine, told a forum in Brussels that $250 million worth of military equipment was on its way to the US-backed regime in Kiev. That latest installment is in addition to the $1 billion of military assistance Washington has provided the Kiev regime since it seized power in February 2014 with the US-backed coup. It was the Trump administration that broke new ground from former president Obama when it signed off on $47 million in “lethal military supply” to the Kiev regime this year in the form of anti-tank javelin missiles. Also this week (third week in December), some 41 US senators signed a resolution calling for “freedom of navigation” exercises in the Black Sea and for more lethal military assistance “to defend Ukraine from Russian aggression”. Russia’s Foreign Minister Sergey Lavrov has warned that the US and other NATO powers are coaching the Kiev regime to instigate provocations against Russia for the purpose of providing a pretext to hit Moscow with further sanctions. There are serious portents that the Kiev regime is planning to launch more provocations against Russia in the same vein as the Kerch Strait incident on November 25. 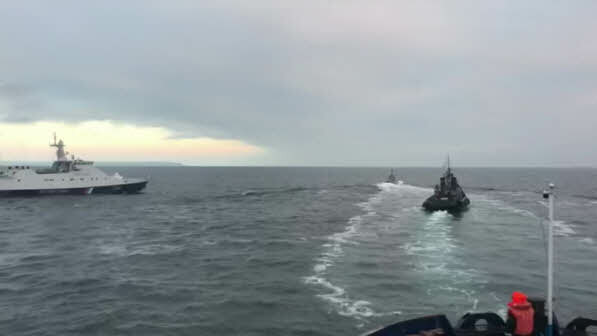 A senior Kiev official, Alexander Turchinov, almost bragged to the BBC this week that more naval incursions were imminent. He also indicated that NATO vessels could be joining future Ukrainian attempted forays through the Kerch Strait. SPUTNIK NEWS / BATTLE FOR WORLD – November 26, 2018: The article highlights that the UN Security Council is discussing the Kerch Strait incident, a day after Russia detained three ships from the Ukrainian Navy that crossed the Russian maritime border, thus violating Articles 19 and 21 of the UN Convention on the Law of the Sea. According to the Russian Deputy Envoy to the UN, the Kerch Strait provocation by Ukraine was approved by the West. BATTLE FOR WORLD / RT AMERICA – November 29, 2018: The video highlights that Governments have never been above bamboozling their own citizens by means of provocations at sea. RT America’s Alex Mihailovich explores the ominous parallels between the Ukraine-Russia incident in the Kerch Strait and the Gulf of Tonkin incident, which sparked the escalation of the US war in Vietnam back in 1964. BATTLE FOR WORLD / TASS – November 28, 2018: The article highlights that reports of bomb threats in Moscow shopping malls were made from a phone number registered in Ukraine, a law enforcement source told TASS. The source noted that “All telephone calls were made from a phone number registered in Ukraine,” and that an unidentified person called to the security service of the Moscow shopping malls. 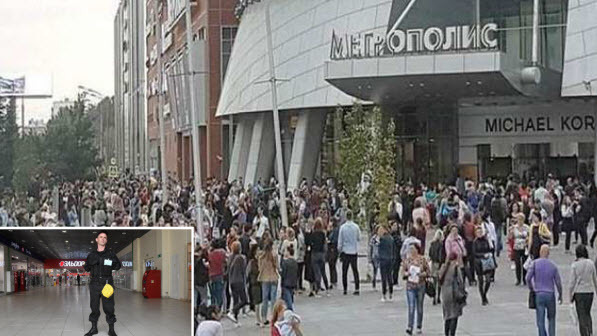 The Russian Interior Ministry’s Main Moscow Directorate, MOSCOW later said all calls about bombs planted at Moscow shopping malls have turned out to be hoax.”All the shopping malls have been inspected and nothing has been found. All the calls turned out to be hoax,” the spokesman said. SPUTNIK NEWS / BATTLE FOR WORLD – November 27, 2018: The article highlights that ‘As you know, yesterday (Monday, Nov. 26) we convened the UN Security Council; Ukraine also spoke in favour of convening such a meeting. I think it was useful for everyone to listen to the truth about what happened. But it primarily depends neither on the [UN] Security Council, nor on the OSCE, nor on any other organization, but on the sponsors [US and EU] of the Ukrainian leadership, who must strongly warn it [Kiev] about the inadmissibility of playing with fire in such a way’, Lavrov told a press conference after talks with his French counterpart, Jean-Yves Le Drian. SPUTNIK NEWS / BATTLE FOR WORLD – November 26, 2018: The article highlights that three Ukrainian ships seized in the Black Sea for illegally crossing the Russian border will be escorted to the port of Kerch, a spokesman for the Border Directorate of the Russian Federal Security Service (FSB) for Crimea, Anton Lozovoy, said on Monday (November 26). “All three vessels have been seized. They are being convoyed to the port of Kerch,” Lozovoy told reporters. According to the FSB spokesman, a criminal case has been initiated under Russian Criminal Code Article 322.3 (illegal crossing of the state border). Three slightly wounded Ukrainian soldiers have received medical assistance, Lozovoy added. The First Deputy Chair of the Russian parliament upper chamber’s Committee on Foreign Affairs, Vladimir Dzhabarov, told Sputnik that the Ukrainian President Petro Poroshenko could have orchestrated the provocation in an attempt to boost his approval ratings ahead of the upcoming presidential election. And that all of this has been orchestrated by Poroshenko, who is lagging behind in the [presidential] election [campaign]. His goal is to introduce the state of emergency in Ukraine to cancel the elections or set up all Ukrainians against Russia in order to try to improve his approval rating with the help of a new wave of anti-Russia sentiments,” Dzhabarov said. The announcement comes days after US President Donald Trump’s special envoy to Ukraine, Kurt Volker, said America is considering delivering even more lethal weapons to Ukraine to fight Russian sympathizers in the country. We do not accept Russian claims about territory in the waters. We believe the presence of Russian military forces has become a provocative, aggressive step, so we are very concerned about that,” Volker said of the Sea of Azov. SPUTNIK NEWS – September 10, 2018: The article highlights that a member of the Daesh* terrorist group, plotting a murder of “one of the leaders” of the self-proclaimed Donetsk People’s Republic (DPR) on the assignment of the Ukrainian Security Service and the Ukrainian radical Right Sector group*, has been detained in Russia, the Russian Federal Security Service (FSB) said Monday (September 10). Russian citizen Medzhid Gabibulaevich Magomedov, a native of Dagestan, a member of the Daesh organization, who was planning the murder of one of the leaders of the DPR militia on instructions from the Security Service of Ukraine and the leaders of the ‘Right Sector,’ has been detained in the Smolensk region,” the press release read. “They introduced him to the representatives of the Security Service of Ukraine and the ‘Right Sector.’ Magomedov was tasked by the Ukrainian intelligence services with eliminating a commander of one of the units of the DPR armed forces residing in the Smolensk region,” the press release read. “Besides, the Ukrainian intelligence services use Daesh members eliminate the leaders of the DPR and the LPR [self-proclaimed Luhansk People’s Republic],” the FSB stressed. TASS – September 10, 2018: The article highlights that an IS militant has been detained for being involved in planning the murder of one of the DPR leaders. Ukrainian intelligence agencies have been actively assisting members of the Islamic State terror group (outlawed in Russia) in planning terrorist attacks on Russian soil and the target killings of Donbass leaders, the press service of Russia’s Federal Security Service (FSB) told TASS. “According to information provided by the detained person [a IS militant detained for being involved in planning the murder of one of the DPR leaders – TASS], in Ukraine, the country’s intelligence agencies have been actively assisting members of the Islamic State international terror group by ensuring their safety, providing them with funds, weapons and explosives for carrying out terrorist attacks in Russia,” the FSB press service said. Ukrainian intelligence agencies have also been recruiting Islamic State members to eliminate militia leaders in the self-proclaimed Lugansk and Donetsk People’s Republics,” the FSB added. TASS – August 31, 2018: The article highlights that instead of complying with the Minsk agreements, the warmongers in Kiev are implementing the terrorist scenario exacerbating the complex situation in the region, Maria Zakharova said. And there is every reason to believe that the Kiev regime is behind the assassination of head of the self-proclaimed Donetsk People’s Republic (DPR) Alexander Zakharchenko, Russian Foreign Ministry Spokeswoman Maria Zakharova told TASS on Friday (August 31). SPUTNIK NEWS – August 31, 2018: The article highlights that according to Deputy Commander of Operational Command Basurin, the U.S. could have taken part in the assassination of the Donetsk People’s Republic head Zakharchenko. Leader of the self-proclaimed Donetsk People’s Republic (DPR) in eastern Ukraine Alexander Zakharchenko was killed on Friday in an explosion in a Donetsk restaurant, a local security source told Sputnik. RT – September 15, 2018: The assassination of Aleksandr Zakharchenko, the leader of the self-proclaimed Donetsk People’s Republic, was committed with the help of western intelligence services, the republic’s acting head said. According to Pushilin, Ukraine’s Security Service (SBU) was involved in the assassination. DPR investigators analyzed the remains of the explosive device that killed Zakharchenko and identified technology that hadn’t previously been used by SBU, he said. TASS – August 27, 2018: Moscow notices that the U.S. is multiplying its efforts to supply Kiev with weapons, Russian Deputy Foreign Minister Sergei Ryabkov told Rossiya-1’s 60 Minutes show on Monday (August 27). “We witness the growing efforts on supplying Kiev with weapons of mass destruction. As I’ve heard, there are plans to expand military exercises in close proximity of our borders,” he said. “This is a direct path to destabilization. The Americans are playing with fire,” Ryabkov stressed. According to him, Moscow talked about this with the U.S. side, namely U.S. Special Representative for Ukraine Kurt Volker. “We hope that he does not keep it to himself for home reading, but at least informs his higher-ups,” the diplomat added. RT / BATTLE FOR WORLD – November 21, 2018: The article highlights the UK will increase its military support to Ukraine, training their special forces and sending a Royal Navy ship to the country, the British Defence Secretary is set to announce, reports the Daily Telegraph. 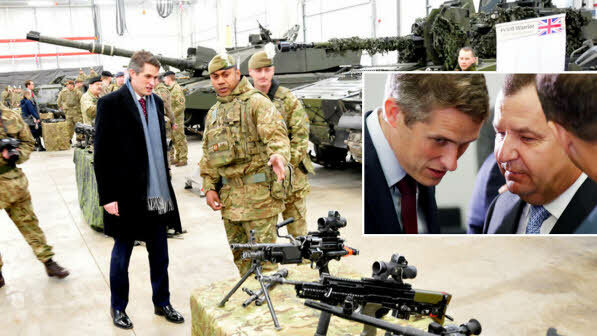 “As long as Ukraine faces Russian hostilities, it will find a steadfast partner in the United Kingdom,” the Defence Secretary will say according to the Tory-supporting Telegraph, who have apparently been provided with access to Williamson’s speech. “Those values of freedom and democracy cannot be traded. I have witnessed on the frontline the effects of the war in the east and this has completely reinforced my support for Ukraine’s sovereignty, independence and territorial integrity,” Williamson is expected to say. TASS – August 31, 2018: The article highlights that Alexander Zakharchenko, who had been Prime Minister of the DPR since 2014, died in an explosion in Donetsk on Friday (August 31). And Russia calls on the Ukrainian authorities to give up the use of terrorist methods as an instrument for the solution of their country’s domestic problems, the Russian Foreign Ministry said in a statement circulated on Friday (August 31). TASS – September 2, 2018: The article highlights that according to the DPR’s reconnaissance data, after assault drills, Ukraine’s 79th assault airborne brigade is about to be pulled from the Nikolayev region to the conflict zone in Donbass, the self-proclaimed Donetsk People’s Republic (DPR) with the use of three army brigades and the Azov paramilitary battalion under control of foreign instructors, Daniil Bezsonov, a spokesman for the DPR operations command, said on Sunday (September 2). The Azov group, formally a unit of Ukraine’s National Guard, is engaged in exercises to drill the skills of combat actions in populated localities. So, it seems that the command of Ukraine’s ‘unified forces operation’ allocates the central role in an offensive to the 36th marines brigade, 56th mechanized infantry and 79th assault airborne brigades. Nazis from the Azov group will be tasked to back the offensive in the rear. All these operations will be commanded by the military from the United States and Canada, or, in other words, by NATO military,” the Donetsk News Agency quoted him as saying. TASS – July 15, 2018: Instructors from NATO countries carry out training of snipers from the Ukrainian Armed Forces who will later be dispatched to the area of so-called “Allied Forces Operation” in Donbass, Andrey Marochko, a spokesman for the militia of the self-proclaimed Lugansk People’s Republic (LPR), said on Saturday. “Between July 8 and September 28, at the 169th training center Desna of Ukraine’s Armed Forces (in the Chernigov region), sniper platoons of the 57th, 58th mechanized infantry and the 10th mountain assault brigades have been trained under guidance from NATO instructors. The personnel is planned to be deployed to the zone of operation in Donbass,” Marochko said. TASS – May 28, 2018: As the country of Ukraine becomes bellicose under the leadership of the United States, Russia will tighten up security measures on the country’s border for the duration of the 2018 FIFA World Cup, Governor of Russia’s southern Rostov region Vasily Golubev, in an interview with TASS. The area, the Rostov sector of the Russian-Ukrainian border, which stretches for about 660 kilometers, includes 400 kilometer-long land border. To ensure that “[security] measures will be tightened on the border, the number of border guards will be increased,” said the governor. And “additional police squads have already been deployed to places of mass gatherings and World Cup venues. TASS – May 11, 2018: Participants in Kiev’s military operation in southeastern Ukraine threatened a Russian diplomat with death at the United Nations headquarters, Russian Foreign Ministry Spokeswoman Maria Zakharova told reporters. “The Ukrainian delegation said it had invited veterans of the [so-called] anti-terrorist operation [in Donbass], including those who were presented as snipers from southeastern Ukraine. After the meeting was over, these men, dressed in camouflage clothing, came up to the Russian representative and began to threaten him with death. Imagine people in camouflage clothing running around the United Nations premises, making photos of Russian diplomats and threatening them. Those were direct threats,” the Russian Foreign Ministry spokeswoman said. TASS – May 3, 2018: Ukraine has actually lost its independence and national economy due to the internal crisis provoked by some Western countries led by the US, Russian Foreign Minister Sergey Lavrov told Italy’s Panorama magazine. “For many years, attempts were made to force Kiev to make a false choice, ‘either with us or against us,’ between the development of cooperation in the East or in the West, which has eventually resulted in the collapse of the Ukrainian statehood, which has never been particularly strong. The result as of today is the de facto loss of independence, people’s suffering, the collapse of the country’s economy, which had every opportunity to become one of Europe’s most stable and strong,” he said. According to Russia’s top diplomat, “a group of Western states led by the US who consider the entire world a sphere of their influence, claiming to be exceptional and dividing peoples into us and them” are responsible for the internal political crisis in Ukraine. RT AMERICA / BATTLE FOR WORLD – November 8, 2018: The video highlights by Anya Parampil reports on a recent criminal complaint filed against the leader of the white supremacist “Rise Above Movement”, which alleges group members traveled to Europe in order to celebrate Hitler’s birthday and meet with likeminded organizations. The FBI specifically claims the Azov Battalion, a regiment of the Ukrainian National Guard known for Nazi sympathies, “participated in training and radicalizing United States-based white supremacy organizations”. RT Producer, Nebojsa Malic, joins Anya to explain how Ukrainian Nazis have been emboldened since the 2014 US-backed coup in the country. 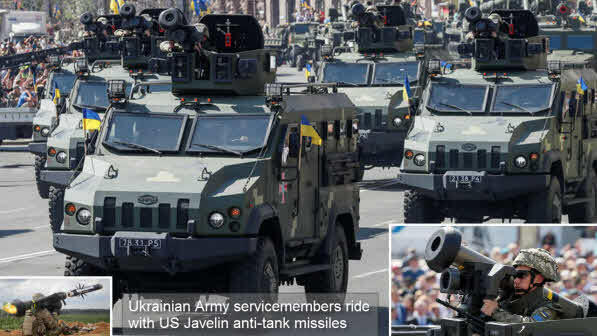 TASS – April 30, 2018: Ukraine’s President Pyotr Poroshenko has confirmed that Ukraine received a batch of US-made Javelin anti-tank missile systems. According to Poroshenko, Washington has fulfilled an agreement and “demonstrated leadership and an important example.” He once again said he relied on commitments of all Ukraine’s partners, first of all the Group of Seven nations. He did not say however how many Javelin systems had been delivered. RT – April 26, 2018: Kiev has warned Moscow of ‘geopolitical consequences’ if Gazprom ceases gas transits through the territory of Ukraine. “If there is no transit through the territory of Ukraine, then the likelihood of a full-scale conflict between Russia and Ukraine is also increasing. European politicians need to understand not only the economic consequences for Ukraine, but also geopolitical consequences for the whole world,” the commercial director at Ukraine’s main gas company Naftogaz Yuri Vitrenko told the 112 Ukraine TV channel. The gas-transit contract between Kiev and Moscow expires in 2019. Gazprom said on Tuesday that the contract will not be extended under any circumstances. The company added that the gas transit may remain, but only if Ukraine provides the necessary conditions for it. “Now the ball is on the Ukrainian side. It should justify the economic attractiveness and the possibility of transit through Ukraine,” said Gazprom Deputy Chairman of the Management Committee Aleksandr Medvedev. Russia wants to significantly cut its gas transit through Ukraine and re-direct it through the extension of the existing Nord Stream pipeline from Russia to Germany under the Baltic Sea. Moscow says Kiev has proved itself an unreliable partner in gas transits over the years. Some of the gas to Europe could also come through the Turkish Stream pipeline, currently under construction. RT – May 4, 2018: Russia’s envoy to the OSCE has called on European nations to stop supporting Ukraine’s “nationalist, inhumane and criminal” operations against the Donbass republics, listing examples of ceasefire violations by pro-Kiev forces. “We call upon all member states of the OSCE [Organization for Security and Cooperation in Europe] not to become accomplices in the Kiev regime’s war crimes, not to provoke a disastrous military conflict in the center of Europe,” Russia’s permanent representative to the organization, Aleksandr Lukashevich, said at the meeting of the OSCE Permanent Council in Vienna, Austria. The Russian diplomat added that the so called “counter-terrorist operation” against the self-proclaimed republics of Lugansk and Donetsk was a nationalist stunt with inhuman objectives and criminal means to reach them. Lukashevich also said that the change of the operation’s format, planned by the Ukrainian authorities, would not lead to peace. “This prognosis is being confirmed by increasingly belligerent rhetoric, additional supplies of imported weapons to the Ukrainian military forces, the arrival of Western military instructors to Donbass,” he said. “We are also warning Kiev against the attempts to repeat the military escapades of 2014 and 2015,” Lukashevich said. TASS – April 22, 2018: U.S. Acting Secretary of State John Sullivan at a meeting with Ukraine’s Foreign Minister Pavel Klimkin has called on the Ukrainian authorities to raise gas tariffs as well as to establish an anti-corruption court, State Department Spokesperson Heather Nauert told reporters. “He urged Ukraine to redouble reform efforts and adhere to IMF programs by adopting legislation to establish a truly independent anti-corruption court and raising gas tariffs to import parity levels,” she said. Sullivan met with Ukrainian Foreign Minister Pavel Klimkin on April 21, on the margins of the G7 Foreign Ministers’ Meeting in Toronto, Canada. SPUTNIK NEWS – April 14, 2018: NATO’s deputy secretary general has called for equal vigilance over Russia’s Gazprom dominance, chemical and nuclear threats, as well propaganda and misinformation during her meeting with the Ukrainian leadership during the Kyiv Security Forum. “Cyber-attacks, disinformation, election interference, the use of nerve agents… every day these dangers confront us now, with the goal of sowing disunity and breaking our resolve. No-one knows this better than Ukraine, who has been battling these techniques non-stop for the past four years,” Gottemoeller said. TASS – March 29, 2018: A total of two passenger trains were delayed in Russia’s southwestern Belgorod region on Thursday because of a grenade found on a cargo train from the Ukrainian city of Kharkov to Belgorod, sources at Russian Railways told TASS. “It’s true that a grenade was found on a cargo train from Kharkov to Belgorod and because of this we had to delay two passenger services,” he stated. SPUTNIK NEWS – March 31, 2018: Foreign militants returning to Europe from conflict zones in Syria and Iraq are actively using the route via Ukraine, Ilya Rogachev, the director of the Russian Foreign Ministry’s new challenges and threats department, told Sputnik. “Many returnees from Syria and Iraq seek to enter Ukraine through Turkey since Ukraine has a visa-free regime with the European Union. So, Western partners created another big problem for themselves. The Turkish side has been making efforts to avert the transit of terrorists through its territory, but it can hardly stop all of them … It is relatively easy to obtain a Ukrainian passport, so terrorists seek to go there,” Rogachev said. According to Rogachev, the European Union introduced a visa-free regime with Ukraine to “encourage Kiev for its Russophobia” and revitalize the country’s European aspirations. As a result, the politicization of the situation with Ukraine has led to a security problem for the European Union itself, the diplomat concluded. SPUTNIK NEWS – April 4, 2018: The rise of ultranationalism, neo-Nazism and far-right extremism in Ukraine fuelled by the Euromaidan coup of February 2014 has been covered by the Russian media on numerous occasions over the recent years. Curiously, it took a mainstream British broadcaster quite a while to finally acknowledge the seriousness and the extent of the problem brewing in Ukraine. The Ukraine: On patrol with the far-right National Militia report by the BBC Newsnight program on April 3, 2018 has highlighted the controversy surrounding the Ukrainian far-right nationalist group and its ties to illegal activity, top officials in Kiev and violent crimes. “Russia branded it a coup, orchestrated by neo-Nazis and fascists. It wasn’t true then but 4 years on Ukraine’s far-right is on the march and there appears little appetite for stopping it,” the report adds. TASS – April 5, 2018: The patrons of the Kiev authorities in the United States and Europe turn a blind eye on attempts to rescind the Minsk Accords and encourage the “warmongers’ party,” Russian Foreign Minister Sergey Lavrov told the Moscow Conference on International Security on Thursday. “There have been attempts at rescinding the Minsk Accords on settling the internal crisis in Ukraine. The current authorities in Kiev in fact disrupt their implementation,” he said. “Their sponsors and handlers in the United States and Europe turn a blind eye on this, while at the same time encouraging the party of warmongers in Kiev, which is determined to deal with the Donbass problem from the position of strength. BATTLE FOR WORLD – August 2, 2017: We have seen this played out time and time again. And now its Ukraine’s turn, given all that monetary aid, most likely it did not know that it would be called upon to “panic” Russia and Eastern Europe with fear-mongering about war. And so the allies of Washington are gifts that keeps on giving for it to create more debt for the US federal budget. TASS – March 30, 2018: Russia has notified the United States more than once of its attitude to the likely negative consequences of the decision to supply US weapons to Ukraine, Russian presidential spokesman Dmitry Peskov told the media on Friday. “We’ve stated more than once this decision will have negative consequences. Moscow’s viewpoint is well-known to Washington. It was repeatedly expressed to our US counterparts. Washington is certainly in the know,” Peskov said, when asked if Russia had discussed the issue of US arms supplies to Ukraine with Washington. US Department of State spokesperson Heather Nauert at the end of December (2017) said: “This proposed sale will contribute to the foreign policy and national security of the United States by improving the security of Ukraine,” the State Department’s Defense Security Cooperation Agency said in a statement. SPUTNIK NEWS – March 1, 2018: The US State Department decided to approve the sale of hundreds of Javelin anti-tank missiles and missile launch units to the Ukrainian government on Thursday, according to an announcement from the Pentagon’s arms exporting agency. The deal is worth an estimated $47 million, the Defense Security Cooperation Agency said. “These missiles are being provided from US Army stocks and then [command launch units] will be obtained from on-hand Special Defense Acquisition Fund-purchased stocks,” the announcement said. TASS – December 23, 2017: Administration has taken a decision to supply advanced defensive systems to Ukraine as part of Washington’s efforts to build up the long-term defense capability of the Ukrainian government, the Department of State spokesperson Heather Nauert said on Friday. “The United States has decided to provide Ukraine enhanced defensive capabilities as part of our effort to help Ukraine build its long-term defense capacity, to defend its sovereignty and territorial integrity, and to deter further aggression,” Nauert said. At the time of reporting, TASS did not have an answer from the Pentagon to a question on what specifically the U.S. was going to supply to Ukraine from now on. ABC News said previously President Trump was expected to endorse a plan envisioning supplies of antitank equipment worth $47 million to the Ukrainian authorities. The list of weapons to be consigned to Ukraine might include the Javelin antitank complexes. If Trump approves the plan, it will then be submitted to Congress that will have thirty days to review it. SPUTNIK NEWS – December 24, 2017: Lithuanian President Dalia Grybauskaite on Sunday said, summing up the events of 2017, that it is better to cooperate with Russia, rather than to fight, expressing Vilnius’ readiness to improve relations. “Our neighbor [Russia] in the coming years will remain complicated, if the leadership remains the same, the situation might also remain the same, but I do not say that it is necessary to wash our hands of them and that dialogue is not needed. The situation is changing, including the geopolitical one… It is necessary to search for possibilities to be open to changes and to change a position where necessary without renouncing values, but I assume that it is better to cooperate rather than fight,” Grybauskaite said in an interview to the 15min.lt online news outlet. The Lithuanian president also mentioned several aspects, which hamper bilateral relations, including Russia’s alleged occupation of territories, the use of force in its interests and meddling in other countries’ elections. SPUTNIK NEWS – An unknown object has exploded in the Ukrainian capital’s center on the country’s Independence Day, at least two people sustained injuries, according to a statement by police. “At 14:06 [11:06 GMT] the duty unit received a report of an explosion of an unknown item on Hrushevskyi Street. A man and a woman were injured due to the explosion,” the statement read. RT – September 6, 2017: Russia has proposed a draft resolution to the UN Security Council on sending UN peacekeepers to eastern Ukraine, to provide security for the OSCE monitoring mission after President Putin voiced the idea. Russia has introduced a draft resolution to the UN Security Council (UNSC) on the establishment of a UN mission that would provide security for Organization for Security and Cooperation in Europe (OSCE) monitors working in eastern Ukraine, the Russian UN envoy, Vasily Nebenzya, told journalists. Russian President Vladimir Putin ordered the Foreign Ministry to submit the draft after voicing the idea at a press conference following the three-day BRICS summit in the Chinese city of Xiamen. SPUTNIK NEWS – August 2, 2017: The US military is working on requirements for inventory of lethal defense weapons that could be supplied to Ukraine, Vice Chairman of the Joint Chiefs of Staff Gen. Paul Selva said in a congressional hearing on Tuesday (July 18). 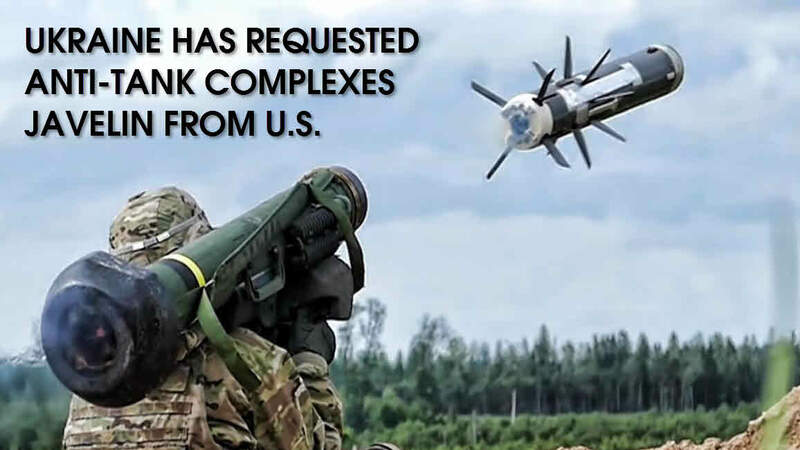 In September 2016, the US House of Representatives approved legislation to allow the supply of lethal “defensive” weapons to Ukraine, but the law still needs to be approved by the US Senate and signed by the US president. Russian officials have repeatedly warned against arms deliveries to Ukraine, stressing that it would only escalate the situation in the eastern part of the country. Different European politicians, including German President Frank-Walter Steinmeier, as well as NATO Military Committee Chairman Peter Pavel have also spoken against arms deliveries to Ukraine. “We are working very closely between the Joint Staff and the US European Command to actually put requirements on the table for an inventory of what that lethal defensive aid might look like,” Selva told the US Senate Armed Services Committee. The US European Command and the Joint Chiefs of Staff will assess the types of defensive lethal weapons for Ukraine and will make recommendations to the US government in the coming months, Selva added. RT – August 24, 2017: The US is considering supplying lethal arms to Ukraine, US Defense Secretary James Mattis has stated during a visit to Kiev. Washington has also agreed to supply Ukraine with an additional $175 million worth of equipment. “I would also point out that on defensive lethal weapons – we are actively reviewing it,” Mattis said at a news conference alongside Ukrainian President Petro Poroshenko on Thursday. “I will go back now having seen the current situation and be able to inform the secretary of state and the president on the specific terms what I recommend for the direction ahead,” he added. The Pentagon chief also said that Washington had recently decided to supply Ukraine with more than $175 million worth of equipment. “For example, we have just approved, just very recently, last couple of weeks, another $175 million worth of equipment, including some specialized equipment that can be used to help defend the country, bringing to a total of nearly $750 million in the last several years,” Mattis stated. Mattis also pledged to support Ukraine over Crimea, which reunited with Russia after a referendum in 2014. Ukraine, backed by Western governments, rejected the results of the referendum, and sanctions were imposed on Russia when the region seceded from Ukraine. “The United States stands with Ukraine in all things,” Mattis said over the Crimean issue. “We do not and we will not accept Russia’s seizure of the Crimea and despite Russia’s denials, we know they are seeking to redraw international borders by force, undermining the sovereign and free nations of Europe,” he told reporters. Washington has planned to provide Kiev with $350 million in security assistance in 2017, according to the 2017 National Defense Authorizations Act. It is $50 million more compared to 2016. The sum is to cover “equipment and technical assistance to the State Border Guard Service of Ukraine for the purpose of developing a comprehensive border surveillance network for Ukraine” as well as “training for staff officers and senior leadership of the military,” the act says.